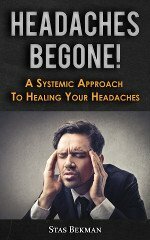 This is an ambitious project, really worth serious effort. While at first glance it looks like a year's work, the writer made this piece in a week of evenings. It will be noted that considerable simplification of the design has been done, but on the other hand, for those who have the time and inclination, there is no reason to stop putting in detail at the point where the author stopped. At the same time, a caution made previously should be borne in mind. There is no urgent necessity for covering every possible surface of a plastic carving with intricate work—after all, the material itself has a pleasing pattern and an unrivalled finish, and the inherent beauty of smooth uncarved surfaces should not be thrown away unless there is some really worthwhile reason. This particular design was chosen from the wide variety of very intricate and exotic Oriental jade, nephrite, amethyst and chrysolite carved pieces in the Woodward collection in the Brooklyn Museum because it lent itself to simplification, and also because it could be worked out in the standard sizes of plastic sheet, without the tremendous waste of material any of the other designs would have entailed. There is still some waste in this design which could have been eliminated, but on the whole it is a rather economical design, considering the impression of bulk that it gives. The original Plate 3Q is carved from a solid block of creamy white jade or nephrite, a little over 1 1/2" in thickness, and of about the size shown. This color and pattern corresponds so closely to what is known as "white natural" in plastics that it requires close examination to tell the difference. It happens that the writer made this particular piece from mottled blue marble, because it was on hand, but the "white natural" would provide a more faithful copy of the original, and also would doubtless give a warmer and more interesting effect under the light mounted above it. The base in the copy, Plate 3R of course represents an extreme simplification of the intricately carved teakwood base on the original, but the general effect is harmonious and easily-achieved. The use of half-inch sheet eliminates a great deal of waste, and also eliminates the necessity of drilling the hole thru the entire length, which might bring up some difficulties. 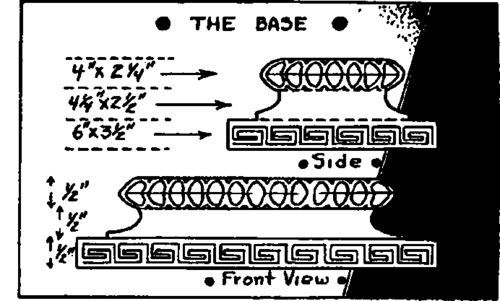 The pattern, Figure 35, is laid out so that the vase is made up of three thicknesses of half-inch sheet. One sheet 6"x1" is band-sawed out and cut apart at "B" the lower portion forming one side of the vase, and the remainder forms the center section of the vase. The remaining piece is cut to the outlines shown from "B" to "A". The space below this is filled in with the two pieces marked "C", and the two handles are cut out from the waste, at "D". The opposite face is duplicate of the lower part of the design, up to "B", cut out of the remaining half-inch sheet, the balance of that sheet being left over. A half-inch-wide section is cut out of the upper part at "E", forming the hole through which the fixture-pipe is passed. 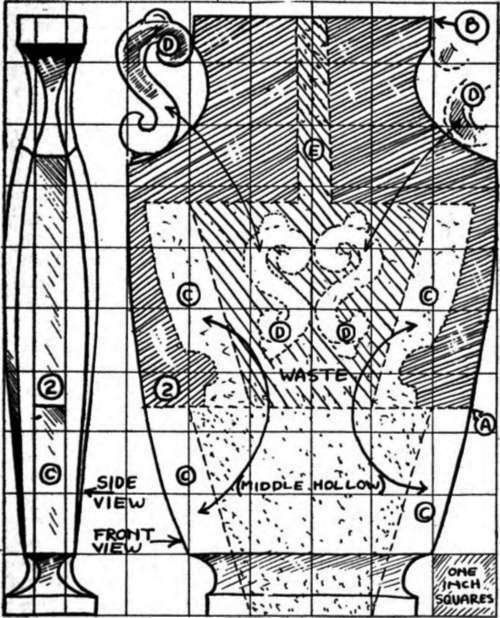 When completely assembled and cemented together, the positions of the four pieces making up the center layer of the vase are shown by the dotted lines. It will be seen that the vase is hollow for the most part. Fig. 35. Cut-out pattern of the hsnd-carved lamp in Project 27. The entire length of the design, from the bottom to "B" is laid out on a 1/2" sheet, 6x16, and the shaded portion is laid above this, on the same shoot. The two handles "D" and the bottom fillers "C" are cut from the center waste, as shown. Prom a second 1/2" shoot, the other face of the vase is cut, using the same sketch, from the bottom of "B". This done, the next step is the shaping and rough carving. The only points retaining the original 1 1/2" thickness are at the belly, just above the center-line in the middle part of the flat surface. There is a tapering off in every direction from this point, as indicated in the side view in the same illustration. The vertical center-line from top to bottom is the fattest point, all surfaces becoming narrower toward the edge, except the square portions 1/2" wide at the extreme top and bottom. This rough-shaping is best done on a coarse grinding-wheel (see Plate 3-0), although good results could also be achieved with rasps and coarse files of various shapes. This done, the entire surface should be sanded down, finished and smooth to the final degree, first with medium sandpaper, then with 8-0, with which every last little scratch is removed. Before buffing, however, the design is laid on, with either a soft pencil or carbon paper, Figure 36, depending on your artistic ability. A pencil-mark will show up clearly on the sand-papered finish. The two handles or ears should be carved and finished before being attached with cement. The easiest way to do the carving is with an electric hand-grinder, as shown in Plate 3P, and the type of cutter-point chosen will depend on how far you want to go with the carving. In the copy shown, the carving consisted only of cutting a shallow groove following the design on the original, but in the original, the entire back-ground was routed away to a depth of 1/16" or and then there was some fine-carving on the remaining surfaces and background. In the copy shown, the bottom of the carved grooves was left unfinished, so that the design stood out in a more pronounced fashion—if it is desired to polish the bottoms of the carved grooves, it will be necessary to use a cutter with a more rounded end. The carving was actually little more difficult than tracing the design, being quite shallow and the material working very easily. A little practise before starting, using some scrap material, is a necessary preliminary, in order to become familiar with the way the carving-cutter will act, since you are working on a prefinished large flat surface, and mistakes would mean lowering the entire surface for a considerable distance around in order to "erase" them. Fig. 36. Carving design for lamp in Project 27. The shaded portations can be routed out to a shallow depth, leaving the clear portions in relief or the entire design merely onUined. The design shown at the top and bottom is repeated on the sides. 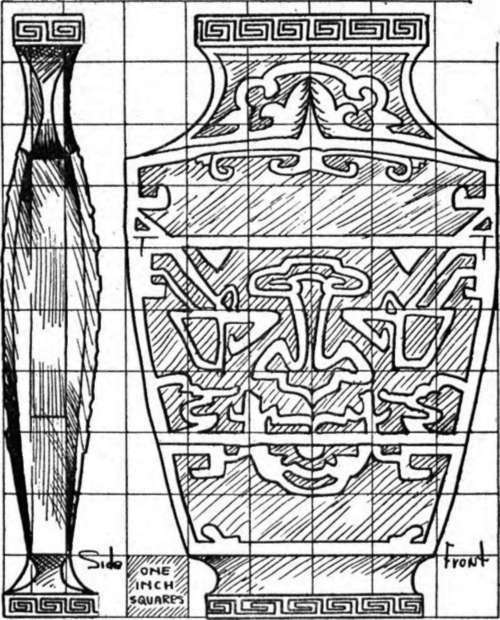 The "teakwood" base (see design in Figure 37), consists of three blocks of 1/2" material, cut in the shapes shown, the upper one being rounded on a disc-sander, and having a slight depression routed out of the top, in which the base of the vase sits. The two upper pieces have a 1/2" hole drilled thru them, for the fixture-pipe, while the bottom one has a 1" hole bored, leaving room for the nut on the end of the pipe and the cord, which is brought out thru a 1/4" hole drilled in the side of the bottom piece. The three parts of the base are cemented together. Fig. 37. Design and dimensions for the base, three pieces of 1/2" Jet blsck, carved, as shown. These are very almple rata, bat when polished, give a very intricate effect. A final buffing and polishing on the wheel completes the project Plate 3R—a lamp you could never buy in the stores, and almost the equal, as far as appearance is concerned, of the priceless original in the Museum.